Sitting side by side at a news conference, Benazir Bhutto and Nawaz Sharif, both former premiers, said that major opposition parties would set out their conditions for what would constitute free and fair elections. The move would allow the opposition to begin organizing for mass protests against Musharraf, though the two leaders still do not agree on whether any protests should be held before votes are counted or afterward. Benazir Bhutto has a clear strategy. Participate in the January 8 parliamentary elections under protest, contest the results with some street demonstrations, push Musharraf out of the presidency, and govern Pakistan from a strengthened prime minister office. The United States has a clear strategy, also. Back Bhutto and her political program, and rely on her to purge the army and security services of pro-Taliban forces and conduct counter-insurgency operations in the northwest and anti-al Qaeda security campaigns with renewed brio. President Bush enraged conservative and nationalist Pakistan opinion on December 3 by poor-mouthing the other main opposition force in Pakistan—Nawaz Sharif—thereby overtly tipping America’s hand in favor of Benazir Bhutto in an interview with AP. The president spoke cautiously about Nawaz Sharif, the former prime minister Musharraf ousted in a 1999 coup who returned to Pakistan on Sunday from exile. "I don't know him well enough," Bush said. Sharif has good relations with Pakistan's religious parties and has raised doubts about his commitment to battling the Taliban and al-Qaida. "I would be very concerned if there was any leader in Pakistan that didn't understand the nature of the world in which we live today," Bush added. The president's statement was important, because it effectively elevated Bhutto’s electoral success to a matter of U.S. policy and more than a quixotic and reckless democratization project by the neo-con rump still remaining in the Bush administration. President Bush’s statement was also particularly blatant and clumsy because a very strong case can be made—using the U.S. government’s own data—that Nawaz Sharif is a heck of a lot more popular inside Pakistan than Benzair Bhutto. The International Republican Institute is America’s tip of the spear for democratization activities. IRI’s most recent polling for Pakistan is from September. A lot has happened since then, but I’m pretty sure that the trends their polling showed have been reinforced by events and strengthened instead of weakening. No surprise about Musharraf’s sky high disapprovals. Cancer is more popular. 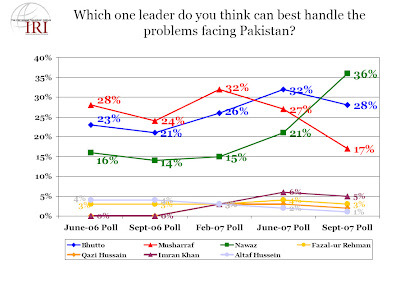 Here’s the key graph: the politician Pakistanis believe can best handle the nation's problems. Clicking on the graphics will enlarge them nicely. For the graphically challenged, Sharif is significantly more popular than Bhutto and his popularity is trending upward while Bhutto is sagging. And that’s before Sharif even returned to Pakistan and political life. Here’s another one, showing relative political strength in Pakistan’s provinces. Sharif owns Pakistan’s biggest province, Punjab. Again, this is before he returned. 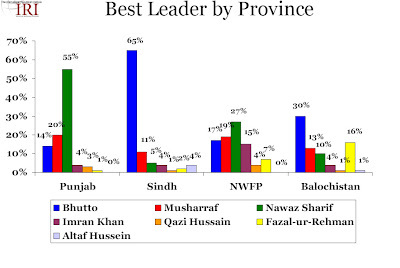 The September snapshot show Sharif and Bhutto dominating in their home provinces of Punjab and Sindh, respectively and splitting support in the smaller provinces; as noted above, the overall trendline shows Sharif strengthening. Has President Bush drunk his own democracy promotion Kool-Aid and is blindly and mistakenly nurturing Bhutto as part of an effort to promote a democratic civil society in Pakistan as a bulwark against jihadist extremism? The Bush administration is exploiting the fervor, abilities, and media savvy of the neo-cons but good old-fashioned realpolitik is at the bottom of our Pakistan policy. Pakistan’s army has little interest in massive counterinsurgency operations in the Northwest. Pakistan’s intelligence service—the ISI—has little interest in trying to exterminate al Qaeda. In both instances, Musharraf’s government is gingerly pursuing accommodation with. tribalist and radical forces. And this policy is not doing very much for America’s program in Afghanistan, where the Taleban is gaining the upper hand and al Qaeda is finding new areas to operate. Washington has clearly made the decision that the army and intelligence services must be brought to heel, both by reforming their personnel and doctrine, and by pushing them out of their central position in Pakistan’s politics. There are only two things standing between the United States and the successful realization of its goals. The most obvious indication of the U.S. desire to sideline the army and intelligence services has been the media campaign to depict Pakistan as a nation sliding into failed state status—in other words, a state that is so dangerous to the world and to America’s interests that overt interference by the United States on behalf of its client, Bhutto, can be defended and, indeed, insisted upon. The basics of the campaign were laid out in the Newsweek cover story Pakistan: the most dangerous nation on earth. (This article, which reads like a Bhutto infomercial, ironically cited the IRI poll, indicating that its results are well-known to US decision-makers, but ignored its most significant findings). The picture presented was of a society under siege from jihadists, ruled by a discredited autocrat, and in danger of sliding into anarchy and losing control of its precious nukes. The nuclear factor is, of course, vital to this framing. The United States can’t justify interference in Pakistan’s domestic politics just because we look askance at Musharraf’s lack of vigor and enthusiasm in supporting our aims in Afghanistan or his reluctance, as a Muslim leader of a Muslim nation, to assist us in trampling on Islamicist political and social movements. But nuclear weapons—hey, that gives us plenty of skin in the game! The apogee of absurdity in this argument was the notorious Frederic Kagan/Michael O’Hanlon op-ed in the New York Times, which posited that Pakistan was “tottering on the abyss” and proposed that we either kidnap Pakistan’s nukes and sequester them in New Mexico or create a Fort Apache nuclear redoubt somewhere in Pakistan guarded by Special Forces and reliable elements of the Pakistan army. One can only assume that the purpose of this idiocy was not to offer a realistic solution. The op-ed was, instead, intended as a piece of perception management: to create the understanding in the mind of the American public that, if Kagan and O’Hanlon are being driven to incoherent hysterics by the prospect of Nukes Gone Wild in Pakistan, then Pakistan must really have a nuclear problem. This Pakistan is not the Pakistan that Pakistanis would recognize. The Pakistan that Pakistanis recognize does acknowledge a worrisome problem with the growing organization and political clout of Islamicists. But the real Pakistan also cares about inflation, democracy, an independent judiciary, and getting the army and the intelligence services out of politics. As a matter of fact, the political crisis that Pakistan is facing is not runaway Islamist extremism; it’s a loss of confidence by its middle class in Musharraf’s rule and military control, as symbolized by the rebellion of the judiciary. Collapse of the Pakistani nation and dispersal of its nuclear weapons into the hands of al Qaeda: not on the radar. What is on the radar, by the way, is the collapse of popular faith in political parties such as Bhutto’s PPP as democratic actors or, for that matter, as anything other than vehicles for their leaders’ vaunting ambition. That’s something that the U.S. might want to take into account when considering the popular support for our favorite rich, educated, pro-Western, tractable, and ethically challenged client. But the key thing to realize is that, in the real Pakistan, Pervaiz Musharraf is not an idiot. Which brings us to Nawaz Sharif. Let’s say that you are an ambitious, able, and crafty army guy named Pervaiz Musharraf who realizes that the United States is twisting your arm to allow an ambitious, able, and crafty politician named Benazir Bhutto to participate in parliamentary elections for the purpose of pushing you and the army and the intelligence services out of power. You know the only reason the U.S. acquiesced when you packed the judiciary and shredded the constitution to get your second term is to get the parliamentary elections off the ground as the mechanism as a vehicle for de facto regime change. You suspect that once the parliamentary election is over and no matter what the results are, Bhutto, with the backing of the United States, is going to cry foul and trot out some color-coded revolution charade to complete her seizure of power. You opinion polls are lower than whale dung and any electoral success you enjoy is going to be understandably, accurately, and indignantly attributed to vote-rigging. The only way to blunt Bhutto’s drive for power is if another powerful, charismatic political leader is added to the mix. His power base is Pakistan's most populous and politically crucial province. Sharif is religiously conservative, and will probably be willing to manage with finesse and understanding the key issues preoccupying the military and the intelligence services: handling the border problems with money and divide-and-conquer policies instead of the high-stakes high-cost military campaign the U.S. is pushing; and keeping a lid on al Qaeda and other extremists by a judicious mixture of accommodation and targeted suppression. The Saudis like Sharif’s take on things and will provide financial and material support for his campaign and international diplomatic cover. So Sharif is allowed to return to Pakistan, where he easily provides a challenge to Bhutto’s shaky credentials as the leader of the opposition. If you’re counting on some piece of U.S. inspired democratic unrest on behalf of Bhutto after the elections, Sharif doesn’t even have to run. Fact is, it’s even better that way. Sharif can nurture his opposition cred by boycotting the elections. If Bhutto tries to use mass demonstrations to challenge the election results and strengthen her hand vis a vis Musharraf, the government happily exacerbates the crisis to the point of gridlock, discrediting parliamentary democracy and letting Sharif pop up as the savior. In fact, the government even has an incentive to cheat in the elections, to push Bhutto into a futile, self-destructive protest. But to every segment of Pakistan society except for the PPP’s adherents, he’s probably better than Bhutto. And, after January 8, if and when Bhutto tries to orchestrate demonstrations with the trappings of a color coded revolution to drive Musharraf from power, I think Sharif will have the army, the ISI, Saudi Arabia, and enough of the Pakistani public on his side. And, in bad news for Bhutto, even if she doesn’t try to upset the apple cart with a color-coded revolution, I think the army and the ISI will find some way to force Bhutto from the scene with some provocation. That’s obviously what the United States is worried about, and what they are working to pre-empt. In a recent private conversation with a former Pakistani government official, Sharif said that he hoped a coup would not be necessary to take power but did not rule it out. Sharif in control would fit the Saudi royal family's desire for support from nuclear power Pakistan but would be a nightmare for U.S. interests because of his Islamist ties. Bush has bet heavily on Musharraf, sending an estimated $150 million a month in aid. But Pakistan is resisting the Pentagon's request to send additional U.S. Special Forces to the Afghan border to help Pakistan's Frontier Corps fight terrorists. Pakistan's dedication to fighting the Islamist terrorists is diluted by officials sharing in gun-running and drug-running. The U.S. return on its massive investment in Pakistan has been disappointing, with hopes for more from Bhutto if vote-rigging does not stop her. There it is, in one convenient package, is the effort to pre-emptively discredit the parliamentary elections as rigged, spuriously insist that Bhutto is Pakistan’s most popular politician, and lay the groundwork for a post-election people power campaign by Bhutto. Most importantly, no doubt aware of Sharif's actual political strength vis a vis Bhutto, Novak advances the all-important strategy—backed yesterday by President Bush--to denigrate Sharif, arguably Pakistan’s most popular politician, as an unpopular, coup-hungry Islamicist in bed with Pakistan’s military and intelligence services. That kind of framing might work for ignorant American audiences preoccupied with their own fears and priorities. But I don’t think they’ll be shared within Pakistan, where American support and policies are virtually an anvil to political oblivion--and our disapproval bestows legitimacy and popularity. It looks like now our only meaningful leverage—since we’ve declared almost open war on the army and intelligence services and decided to go toe-to-toe against the Saudis by trying to block their candidate—is Benazir Bhutto’s political organization, her appetite for power—and risk—and our multi-million dollar monthly anti-terrorism subsidy to the Pakistani army. By mid-January, we’ll know how much that got us. The full September 2007 IRI polling on Pakistan, from which the charts shown above are reproduced, can be found here.